CHELMSFORD, Mass. 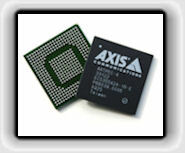 – January 11, 2012 – Axis Communications, the world leader in network video, introduces the newest version of its in-camera chip: ARTPEC-4. The latest version of the market-leading system-on-chip (SoC) specifically designed for network video products significantly enhances image quality and video analytics performance in Axis’ network cameras and video encoders. ARTPEC-4 (Axis Real Time Picture Encoder) is designed to offer video with lower noise and higher light sensitivity for sharper images of moving objects. In fact, the chip is a key enabler of Axis’ unique Lightfinder technology, which allows an IP camera to ‘see’ colors and detail clearly in dark and low-light conditions. Lightfinder is found in the award-winning AXIS Q1602 Network Camera, the market’s most light sensitive surveillance camera. In this latest chip, Axis has added support for the H.264 Main Profile, which is a more efficient compression method. ARTPEC-4 supports simultaneous H.264 and Motion JPEG streams, which means that video streams can be optimized individually based on the needs of the customer. All in all, this leads to better HDTV video, increased flexibility and lowered costs for network infrastructure and storage. With a powerful CPU and a coprocessor for accelerating video analytics, ARTPEC-4 also boasts more processing power for intelligent video analysis. This is particularly beneficial for applications running on the AXIS Camera Application Platform for scalable, distributed analytics in video surveillance. Furthermore, as the shift from analog to IP video surveillance solutions accelerates, video encoders are generating significant interest from the market as a migration strategy to digitizing working analog cameras. Since ARTPEC-4 offers improved de-interlacing and multi-channel video ports on one chip, it lowers the cost per port for video encoders and enables more affordable, multi-channel video encoder products. "The development of ARTPEC-4 underlines the importance of our in-house development in cementing our leadership in the technology field. With our newest chip we see improved image quality leading to more usable video surveillance systems, broadening the usage of Axis cameras in more applications and extending the scope of where they can be used," said Johan Paulsson, CTO, Axis Communications. ARTPEC-4 is optimized for Axis’ video encoders and IP network cameras, and will complement the existing chip portfolio, which also includes the world’s first HDTV-enabled network camera chip, ARTPEC-3.